Xenia’s Blayne Dudley slides safely into second base. 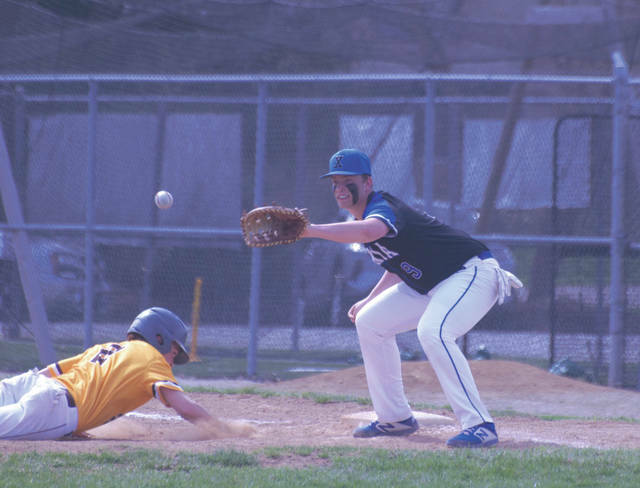 He would later tie the game by stealing home in the Buccaneers’ first-game win over Kettering Alter, April 13 at Xenia High School. 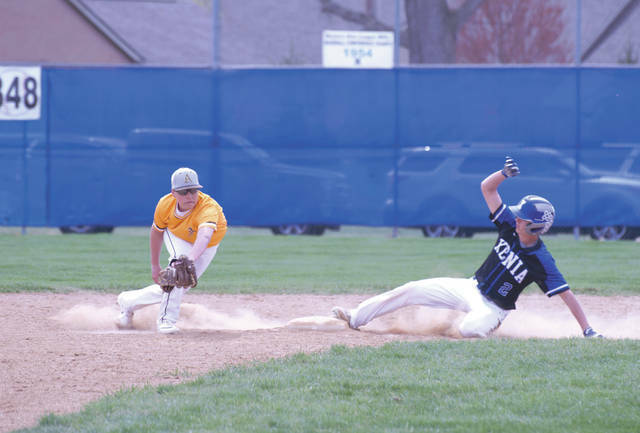 Xenia senior first baseman Warren Mahar receives a pass from pitcher Kyle Lane in an attempt to pick off Alter’s Danny Mangin, April 13 in a high school baseball doubleheader. Xenia senior Dylan Hall starts the April 13 doubleheader off pitching against the visiting Alter Knights. 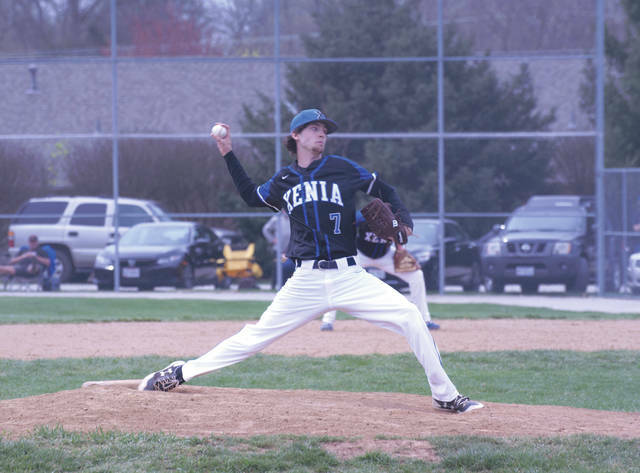 XENIA —In dramatic fashion, host Xenia earned a doubleheader sweep over Kettering Alter. The Buccaneers were tied 4-4 in the bottom of the seventh inning to the Alter Knights, after Xenia’s Blayne Dudley stole home. Two batters later, Warren Mahar hit a single to Aaron Adkins with the walk-off game winning run. The dugout emptied as teammates ran up to hug Mahar, after being down 4-1. A few hours later, Xenia made a second comeback after starting out down 4-0. The Bucs completed the sweep of the doubleheader against Alter with a score of 13-11 pushing their record to 15-2 on the year. The Alter Knights (3-8) had started a chant of “Let’s get weird!” to hype each other up when they had the lead. However, this kind of weird likely wasn’t what they were hoping for. As the day progressed, things certainly got weird. In addition to the two comebacks, neither team could seem to find the strike zone in either game. There were way more balls called than strikes as both teams dealt with some pitching control frustration. Claus said he was happy his team could pull off the wins, but the slow starts and errors on defense had to get fixed going forward. Xenia will play next at 5 p.m., Tuesday April 16, at Trotwood-Madison in a Greater Western Ohio Conference South Division game. Alter was back in Greater Catholic League Co-Ed play on Monday with a home game against Fenwick. They then play at Fenwick on Wednesday.